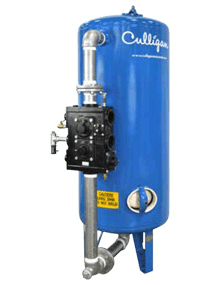 Culligan Water Systems Boiler Water Treatment programs are designed to minimize a facility’s steam systems Total Cost of Ownership. Proper treatment inhibits corrosion and scaling on heat transfer surfaces reduces equipment downtime, as well as lessens the impact of water and fuel costs. Culligan Water Systems delivers value in line with customer’s needs. As an OEM of water conditioning systems (Softeners, Reverse Osmosis, Deionized Water Generation) coupled with control equipment solutions, hands-free chemical delivery, and value added resources, Culligan experts have the capability to make an impact on a plant’s operational benchmarks. Chemical pretreatment of the feedwater typically takes place in the Feedwater Tank or Deaerator. This process is necessary to chemically remove oxygen and supplement any alkalinity required for quality boiler water. This step generally requires an oxygen scavenger and an alkalinity adjunct to ensure the feedwater is of good quality to reduce the potential for a multitude of corrosion possibilities. 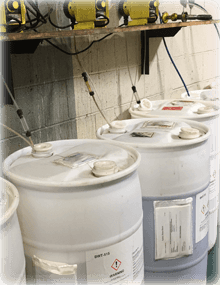 The first step, and arguably the most important step to achieving excellent results, is pretreating the make-up water to remove dissolved solids in the make-up water source by mechanical operation. Solutions typically range from utilizing Water Softening to Reverse Osmosis. The proper solution depends on the efficacy of the system and the quality of the incoming make-up water source. To protect the system piping network and capital equipment, a steam and condensate chemical is added to buffer the pH. These chemicals are most commonly a blend of neutralizing amines and filming amines which facilitate a buffered pH (pH of 7.5-9). Buffering the pH reduces the potential for the formation of carbonic acid, which is the main contributor of a system’s deterioration. These value-added services ensure the utmost steam system efficiency. The resulting information can be utilized to identify capital equipment operation, cost savings opportunities, as well as facilitating the plant’s understanding of their steam system. Steam Mechanical Troubleshooting identifies the correct operation of steam equipment.that is essential to support plant processes. Culligan can help troubleshoot the issue for solution development. The Steam Trap Analysis determines whether the proper type, size, and function of a system’s steam traps is being applied. 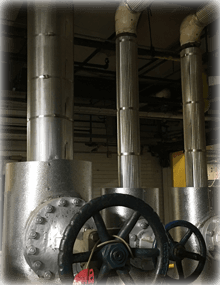 Faulty steam traps waste energy which increases the operational cost of the steam system. 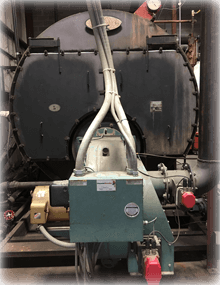 Conducting the Annual Boiler Inspection allows Culligan to evaluate the overall operational effectiveness of the Boiler System’s Chemical Treatment Program. The Softener Inspection can be accomplished any time of the year; however, it is best to inspect the system in conjunction with the Annual Boiler Inspection. Culligan can conduct an elution study as well as inspect the aspects of the softener for correct function.